Mitsubishi GT-PHEV Concept - previews next Pajero? 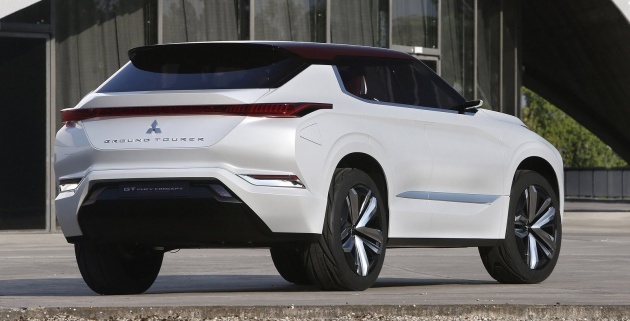 Home » Cars » Mitsubishi GT-PHEV Concept – previews next Pajero? Mitsubishi GT-PHEV Concept – previews next Pajero? As promised, the Mitsubishi GT-PHEV Concept has made its debut at the 2016 Paris Motor Show. MMC’s showcar previews a “high-end next-generation SUV” and showcases the company’s latest design language and plug-in hybrid EV (PHEV) system using triple motors, plus all-wheel control tech. The GT-PHEV Concept’s front end wears Mitsubishi’s now familiar “Dynamic Shield” mask, which has been developed and evolved since 2014. The blacked-out grille, highlighted by chrome grille shutters and a piano black upper section, can open and close to balance aerodynamic and cooling requirements of the PHEV system. The low floating roof, finished in contrasting burgundy dark red that matches with the interior upholstery, adds to the overall dynamism to the silhouette. The C-pillar design is inspired by an airplane’s tail fin. The horizontal hood, flat roofline and sharp character lines also make this a very eye-catching concept. They tried to create the impression that the car had been carved from a single ingot of steel. Inside, the GT-PHEV uses a horizontal cockpit-style dashboard that creates a spacious ambiance, but also wraps around its occupants. There’s generous use of burgundy leather trim. The GT-PHEV’s triple-motor PHEV system (MMC’s current PHEVs use two motors) comprises a 25 kWh high-capacity drive battery package under the floor and three high-output motors with integral Silicone Carbide (SiC) frequency inverters. The internal combustion engine is a 2.5 litre petrol unit featuring improved electricity generation performance and motive performance, Mitsubishi says. In Series Drive Mode, the engine acts as a generator and runs at high thermal efficiency. The engine size has been optimised for use in Parallel Drive Mode and with a two-speed front transaxle. The system selects the high reduction ratio gear for better fuel economy when driving at higher speeds under normal circumstances, and the low reduction ratio gear for better acceleration when climbing or overtaking. S-AWC includes Active Front Differential (AFD, which controls torque split between the front wheels), electric Active Yaw Control (AYC) at the rear and Active Stability Control (ASC). Connected car technology feeds back route information as well as weather and road surface data to the car, which uses it to manage energy consumption such as electricity consumption and fuel economy as well as to provide AWC that’s best-suited to the situation. What say you if this showcar previews the next-generation Pajero? How many years to have concept display…? The Pajero had a history of solid all purpose vehicle for towing and with off road ability. 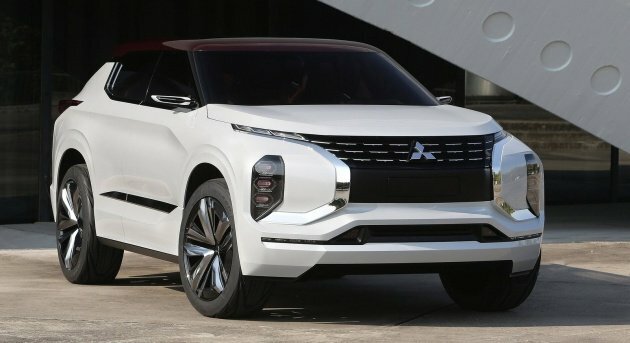 It is obvious that Mitsubishi has decided that they are no longer interested in that market but are off on another tangent. Having found the 2015 Pajero had lost it’s way in so many small areas, it is no wonder it is now completely lost. Won’t look like that once it hits production (izzit? ), so why bother? Mitsubishi, you have to learn from your brethren Toyota and Honda….. start hiring engineers who can turn concept into HVM reality, not just for motor show.